If you can’t eject the disc from your Xbox One X, Xbox One S, or original Xbox One, try the following. Press the Xbox button on the controller to open the guide. Select System and then choose Restart console. After restart, press the eject button next to the disc slot to remove the disc. If your Xbox is frozen, press and hold the Xbox button on the front of the console until it turns off. Press the Xbox button again to restart, and then press the eject button. This video shows how to use a paper clip to eject a disc from the original Xbox One. Important Unplug the power cord and other connected cables first. Uncoil a large paper clip. A standard clip is too short. Your clip must reach 2 inches (about 5 centimeters). 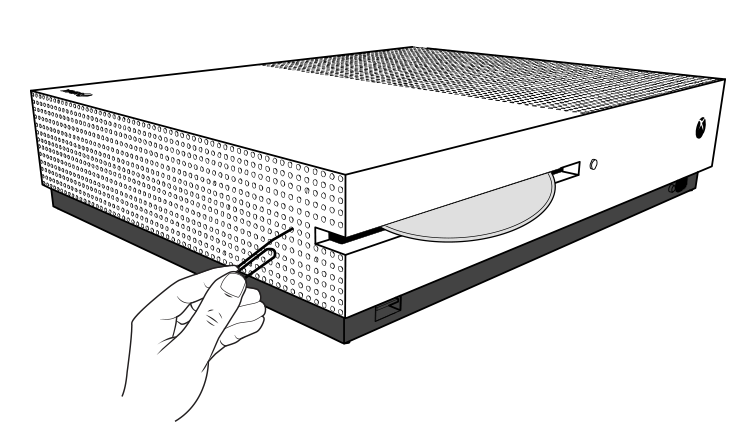 Insert the end of the paper clip into the eject hole, which, on all Xbox One consoles, will be found on the left wall of the console, around the corner from the disc slot. The hole is hardest to find on the Xbox One S, the left side of which is a grill full of holes. Start with the hole that’s second from the right and second from the bottom. 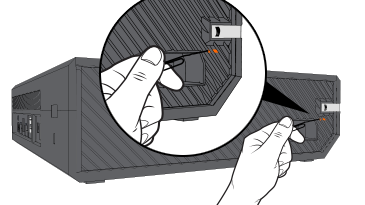 On the original Xbox One, find the hole between slats on the left side, just below the connect button for wireless controllers. Because of the angle of the slats, you need to be facing the side of the console directly to see the hole. On the Xbox One X, the hole is in plain view, but below the grill on the left side. As you push in the clip, the disc will pop out, but only a little. Pull it the rest of the way out using a lint-free cloth to keep the disc clean. To keep this from happening again, make sure the disc isn’t sticky and doesn’t have a label that’s thick or peeling. Would you like to contact Support regarding the "Manually eject a disc from Xbox One" issue you were reading about or a different issue?